Located by the St. Lawrence River, Quebec City has several different sections. Vieux Quebec (or Old City) is the center of the town. It is surrounded by large, thick stone walls that protected the early settlers from danger. The St. James portal still exist; in the 1600s this gate was closed at night for protection. The city is divided between Basse Ville (lower town) and Haute Ville (upper town). The lower area between the river and the cliff is known as the Quartier Petit Champlain. From this charming area, there is easy access to the St. Lawrence River but also stunning views of the Upper City. The Iroquois first inhabited the area calling their village Stadacona. In 1535, Jacques Cartier discovered the site. In 1608, Samuel de Champlain, established a fur trading post which became a major port. During the 17th and 18th century, France and England fought many wars over the port. In 1759, the British officially took over. The influence of the French remains in Quebec City in both its architecture and language; 95% of the people in Quebec speak French as their primary language. Perhaps the most famous, photographed spot in all of Quebec City (and one of the most photographed hotels in the world) is the Fairmont Chateau Frontenac Hotel. This is where we choose to stay. Built in the 19th century, the hotel looks straight out of a fairy tale. It dominates the Quebec City Skyline while also being situated near the historic citadel. The Chateau is one of Canada’s grand railways hotels built for the Canadian Pacific Railway Company. The hotel was named for Louis de Buade, Count of Frontenac, who was the governor of New France from 1672-1682 and 1689-1698. In 1943, the Quebec Conference occurred at the Chateau; Churchill, Roosevelt and William Lyon McKenzie King (Prime Minister of Canada) discussed strategy for World War II. In 1980, the Chateau was declared a National Historic Site. The Chateau is truly a grand dame of hotels featuring 600 rooms, 16 floors, and several courtyards. It also includes an indoor pool, a spa, a gym, and 3 restaurants. The formal English afternoon tea is extraordinary. Our dinner at, Sam’s was amazing! My daughter was thrilled with an appetizer of popcorn with truffle oil. In addition, the Chateau has the most incredible views overlooking the St. Lawrence River. The Terrasse Dufferin, a wide promenade on the cliff outside of the Chateau, is the perfect place to stroll and take in the view. During Winter Carnival, the Chateau’s location provided us with easy access to so many of the winter activities. On our first night, we dined at Aux Anciens Canadians. This restaurant is located in the oldest house in Quebec City. Built in 1675, the house known as Maison Jacquet was also the largest house in its day. It was given to Francious Jacquet by nuns who lived in the nearby Ursuline Convent. In 1966, the restaurant opened serving authentic Quebec cuisines. Vegetarians beware- Quebec cuisine revolves around meat! Each of the five dining rooms is decorated with antiques, collector’s items and marvelous wood carvings. It was the perfect way to start our Quebec City carnival adventure. This year was the 64th Winter Carnival in Quebec City. We couldn’t wait to explore the different activities. Anyone visiting at this time must be prepared for very cold temperatures. One day it was -22 but that didn’t stop us from enjoying the carnival. Lots of warm layers are a must! There are so many activities to take in which are located throughout the city. On the Terrasse Dufferin, a long toboggan slide stands. Visitors can grab a wooden sled and climb up and experience this exhilarating ride. In Palace George V Square, an international snow sculpture contest has taken place for 46 years. This year, 5 countries were represented: Argentina, Canada, France, Ukraine, and the United States. It’s amazing to see both the small models used to create the design as well as the finished products. The sculptors work while the festival is occurring so it’s fun to watch their techniques. The Grande Allée, (a long street stretching from the Chateau through Quebec City) is open only to pedestrian traffic. Several activities occur here. In front of the Parliament building, the Via Rail Ice Slide stands. This 90m slope is made entirely of ice; it looks like an ice version of a Formula 1 racetrack! Visitors can ride a sled down the slide- so much fun! Various food stands and games can be played along the Grand Allée. Our favorite stop was the Sucré Shacks (sugar shacks). We were given a wooden popsicle stick and then walked over to a large snowy shelf. The proprietor poured hot maple sugar onto the snow. We rolled the stick in the snowy and sugar and had a sugar snow pop. OMG so sweet and yummy! One other spot to visit along the Grand Allée by the Parliament, is the Ice Palace. This enormous ice building featuring graffiti murals by various artists is the home of Bonhomme, the Carnival Snowman Ambassador of the Carnival. The Palace is the site of the opening and closing ceremonies, the crowing of the Carnival Queen and the center of the carnival. On Tuesday and Thursdays, Bonhomme skates with festival goers at an outdoor skating ring erected in Place d’ Youville. Bonhomme’s image is scattered throughout the city! Perhaps my favorite carnival event was the ice canoe race. We descended on the funicular to the Quartier Petit Champlain to stand along the banks of the St. Lawrence. 60 teams comprised of men and women race 2 times across the river between the Louise Basin in Quebec City and the Quai Paquet across the river. Having been a college rower, I was so intrigued by this race. I honestly have never seen anything like it. The teams navigated their boats through the cold waters. When they encountered an iceberg, the all jumped out of the boat and pushed it along the top of the iceberg. When they hit the open water, they jumped back in the boat. It was an unbelievable site!! While we loved Winter Carnival we decided to explore a little bit of the country outside of Quebec City. We visited Montmorency Falls located along the cliffs next to the St. Lawrence River about 9 miles North East of Quebec City. Seeing the Falls in the winter was amazing. The Falls stand 272 feet or 83 meters. That is 30 meters higher than Niagara Falls (but not nearly as wide). We took a cable car from below the Falls up to the top of the cliffs. From there a short walk brought us to a wide wooden footbridge that crossed the top of the Falls. There are so many hiking trails surrounding the Falls; during winter are used for snow shoeing. We saw ice climbers scaling the frozen area of the Falls called the sugar loft or cone of ice at the base. We weren’t up for ice climbing but we decided to brave the chilly weather and go dogsledding. We were not disappointed. We toured beautiful trails through the snowy woods being pulled by a team of 5 strong dogs. The coolest part about dog sledding in the Canada is that visitors are actually allowed to drive the sleds after a brief lesson. Drivers and passengers take turns. I can’t imagine being a part of the famous Iditarod dog sledding race in Alaska after just trying to control my sled for 45 minutes in the woods of Canada! 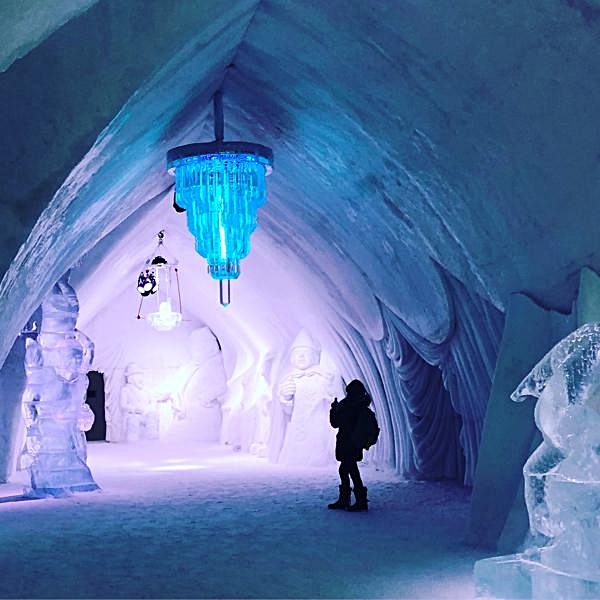 The last place we visited was like being in a real-life version of the movie “Frozen.” The Hotel des Glace (or Ice Hotel) located in Valcartier (45 minutes from Quebec City) was unlike any hotel I had every visited. For the last 18 winters, the hotel is redesigned with a new theme. 50 builders construct the hotel during the month of December. It opens to guests for the next three winter months. 300,000 tons of snow and 500 tons of ice create the 4 feet thick walls of the hotel. The hotel consists of a grand hall, a bar with music, high arches, sculptures, and a grand slide that even Elsa would love. There are 51 different themed bedrooms with double beds with a wood base and mattress supported by ice. It is truly an architectural wonder. Outside of the hotel is an ice chapel which has been named of the top 10 dream wedding spots. 275 weddings have been performed in the chapel since it opened. Surrounding the Ice Hotel are many different activities. There are countless snow tubing trails and many hotel tubs! Right next to the Ice Hotel is actually another hotel. If you choose to spend the night in the Ice Hotel you also receive an indoor room (for bathroom use, storage for clothes and changing or for sleep if you are too cold in your ice bedroom). Located adjacent to the indoor hotel, is also an indoor water park. We came to marvel at the architectural feet of the Hotel des Glace but there were lots of activity options for anyone wanting to spend more time in the Quebec countryside. Visiting Quebec City feels like stepping back in time to a quaint French town. I loved the European, old world vibe, the friendliness of the people, and the French/ Canadian food. Winter Carnival was a spectacular festival to attend. While Canadian winters can be chilly, braving the cold to experience Winter Carnival and this unique charming city is a must experience!